On our diamond jubilee, you are a part of the story! It’s an exciting time at St. Michael’s — looking back at our history for the last six decades, we see that all the blessings God has given us are meant for the building up of his kingdom. So in 2019, we will celebrate all that God has done for and through St. Michael’s. But more than that — it will be an inspiration that will launch us into making an even greater impact as a truly missionary church. And you are a part of it. Here, he shares the idea behind our diamond jubilee: to let your diamond shine. Saturday, Jan. 26, 2019 — St. Michael’s Youth Celebration coincides with World Youth Day in Panama. 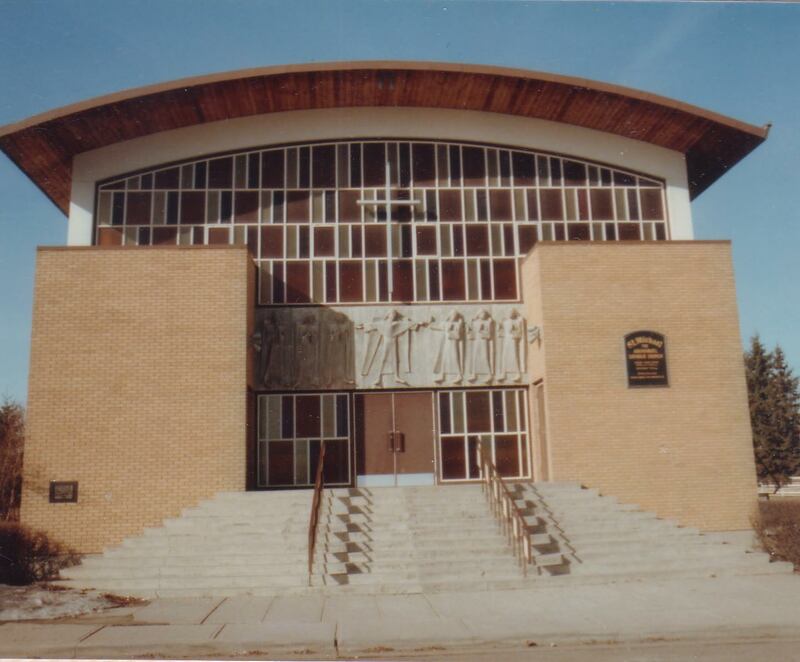 Friday, May 3, 2019 — 60 years ago on this day, the first Mass as St. Michael the Archangel Parish was held at John Kinahan School. Join us for Mass this day at 7 p.m., with a social to follow. Created using the Donation Thermometer plugin https://wordpress.org/plugins/donation-thermometer/.$10,000$4,315Raised $4,315 towards the $10,000 target.43% St. Michael’s has committed to participating in Habitat for Humanity’s interfaith build days in May and June. All are invited to support the project and address the need for affordable homeownership by helping us raise the funds we need. To donate to this project, click here. If you have any questions or want more information, please email Marc at marcinyyc@gmail.com. This year’s Taste of the World festivities will showcase and celebrate the many different cultures represented in our parish community. When: Saturday, June 15, after the 5 p.m. Mass. We will have a party on Friday, September 27 at 7 p.m., and Mass with Bishop McGrattan on Sunday, September 29 at 11 a.m., followed by a family celebration. Volunteers needed! Calling caterers, event planners, and all those interested: if you’d like to get involved with St. Michael’s Fest, email Tammy at tammyringstad@shaw.ca. Exact date TBA, but there will be a Music Ministry celebration with wine and cheese this Fall. Stay tuned for more info. Dec. 14-15, 2019. More details TBA. 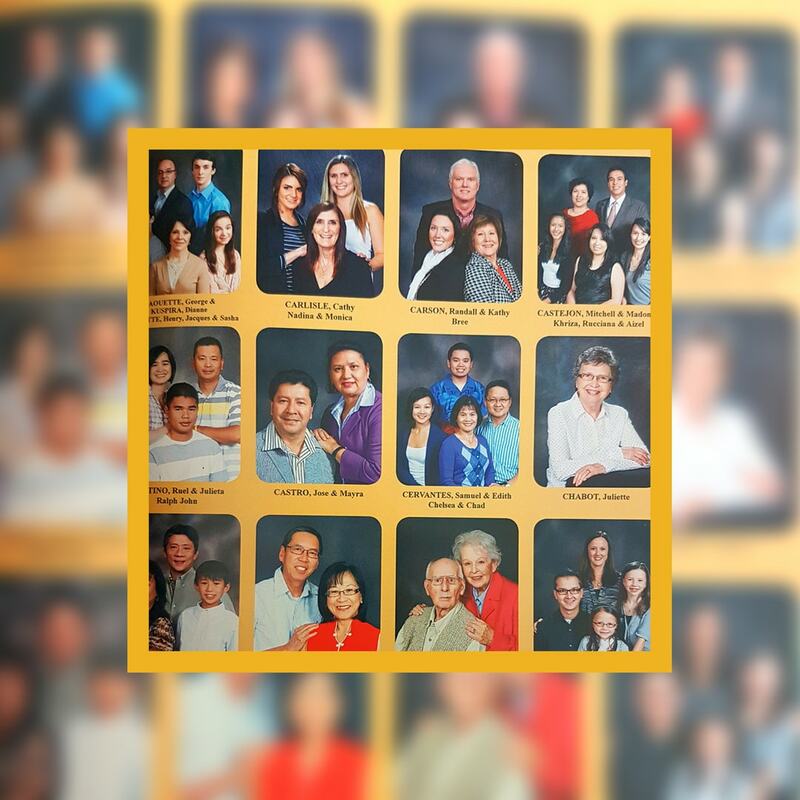 Thank you to all who participated in our 60th anniversary photo directory program. Our last date for photo sittings was April 10-13. At this point, we no longer have any further photo sessions and are no longer accepting photo submissions. The photo directory is set to be published this coming June. Families who had their photos taken will receive a copy around this time, unless there are any unforeseeable changes, delays, etc. If you have any questions, please email Heather at heathermontschilling@gmail.com. Fr. Arthur Anderson: Pastor from 1959-1971. On April 6, 1959, St. Michael’s Parish was established by Episcopal authority by a decree issued by H.E., the Most Rev. F.P. Carroll, Bishop of Calgary. Rev. 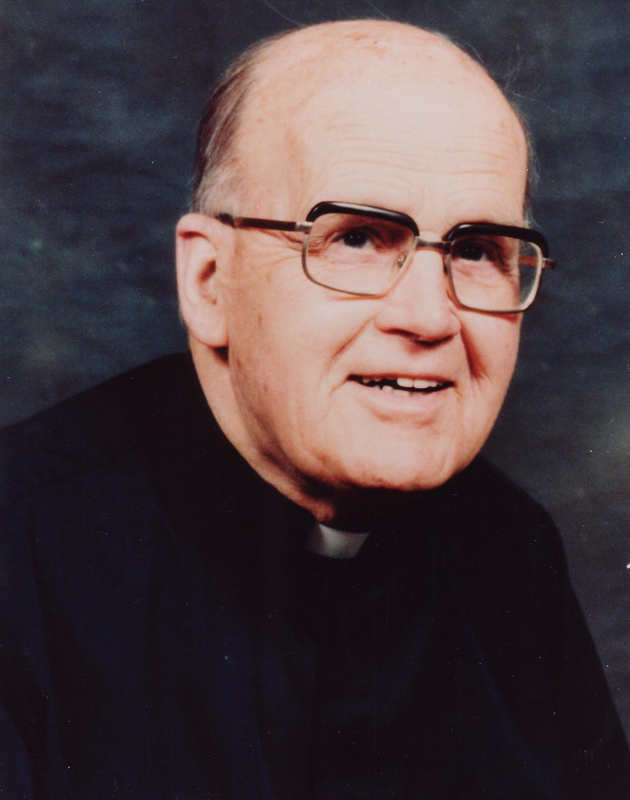 Arthur Anderson, at that time the parish priest of St. Francis Church, was appointed Pastor. 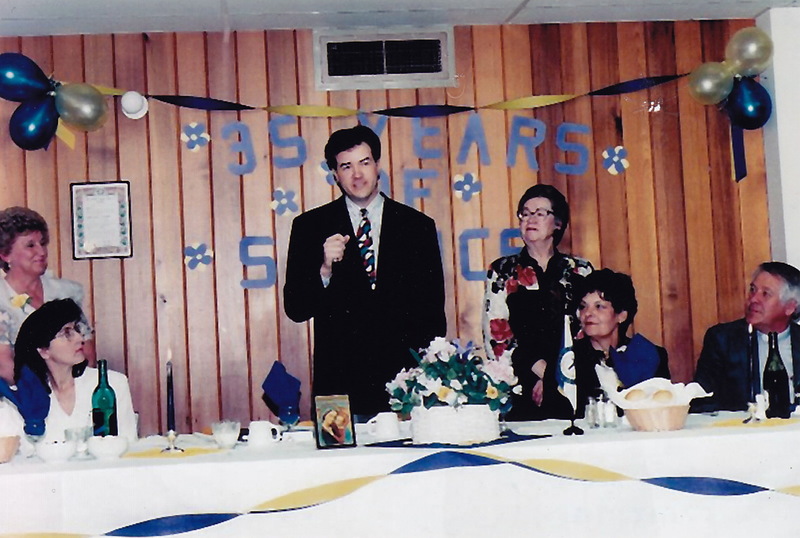 On May 3, 1959, the first Mass as a parish was celebrated at John Kinahan School, which would eventually become the center of all parish activity for the next two years. On May 24, 1959, the Catholic Women’s League (CWL) was officially established in the parish, with Mrs. Hermon Stevens (eventually the National President of CWL) conferring the Charter and installing the first slate of officers. 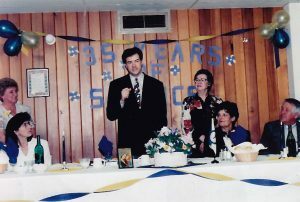 Then-alderman Dave Bronconnier with St. Michael’s CWL on their 35th anniversary celebration. Photo taken in 1994. July 1959: a house at 416-36 Street SW was rented as a rectory. Mass was celebrated at the dining room on weekdays. During the summer of 1961, a house right next to the church property was purchased which was used as a rectory until 1974. The basement was furnished as a chapel, which accommodated about 40 people. The newly-constructed auditorium at St. Michael’s Elementary and Junior High School afforded another place for Mass. The school has been used every Sunday since, in conjunction with John Kinahan School. On November 25, 1961, Rev. Donald Roberts, ordained in May 1961, was appointed Assistant Pastor at St. Michael’s. Since that time, Fr. Roberts has established a very successful and active CYO and CCD study group. Father was also in charge of the altar boys of St. Michael’s. 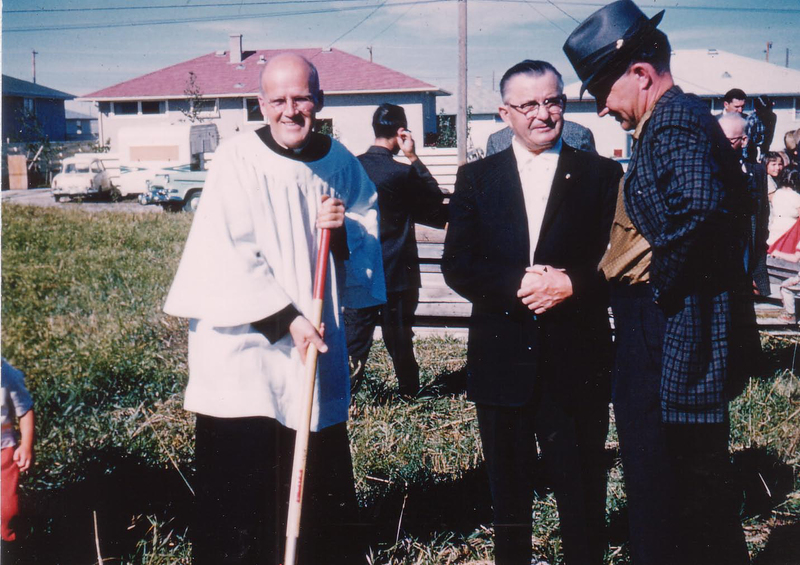 Sod-turning for the new St. Michael’s church happened on Sunday, September 9, 1962. Construction followed on the following day, Monday. L-R: Fr. Arthur Anderson (1959-1971), Nick Y. (Contractor), Jack Massier during the sod-turning. On June 7, 1963, Bishop Carroll solemnly dedicated and blessed the completed church under the title of St. Michael the Archangel Parish. Old St. Michael’s church building located on Bow Trail. Five years later, on July 15, 1968, the first parish pastoral council held its first meeting, chaired by Ted Valentine, in keeping with Vatican II’s recommendation in the Decree on Bishops, Christus Dominus. 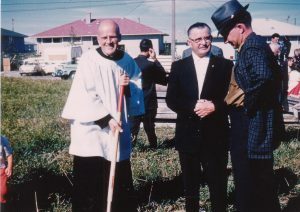 In August 1971, Bishop Paul O’Byrne invited the Oblates of Mary Immaculate (OMI) to Calgary, to whom the pastoral and temporal care of St. Michael’s Parish would be entrusted to. 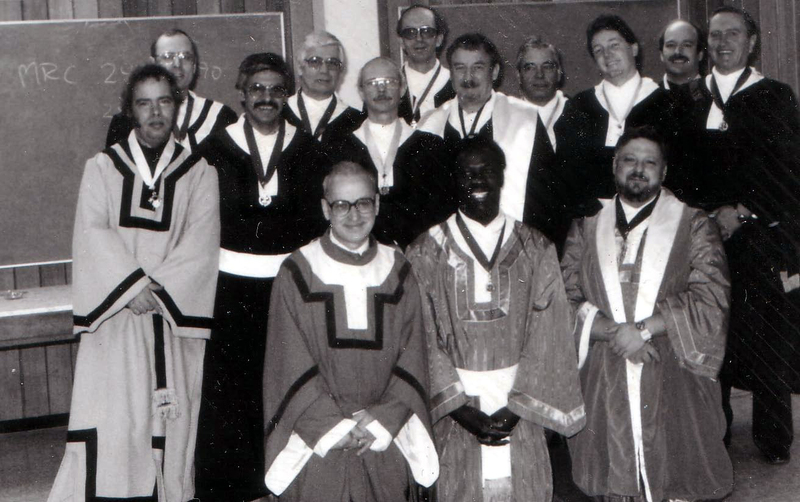 The Knights of Columbus established the Father Lawrence Carroll Council in (St. Michael’s) in March 1984. St. Michael’s Father Lawrence Carroll Council # 8636. Photo taken in 1984. 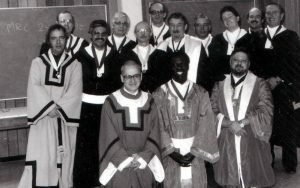 1992: After 21 years and 11 priests, the Oblates of Mary Immaculate (OMI) withdrew their ministry in Calgary. On August 1, 1992, Fr. Len Hagel was appointed Pastor of St. Michael’s. May 1993: the weekend celebration of the Eucharist was moved to John Costello Elementary School in Strathcona to make way for a major church renovation. Six months later, on November 27, 1993, parishioners returned to St. Michael’s, which can now accommodate 500 people. Following the death of Fr. Len Hagel on October 13, 2005, Fr. Julian Studden was appointed the new pastor of St. Michael’s on November 11. On 2008, it was determined that a new church had to be built. With the dramatic growth that the parish was experiencing, the current church — designed to accommodate 500 people — was now inadequate to house 1,500 families. The sod turning for the new church took place on June 28, 2009. 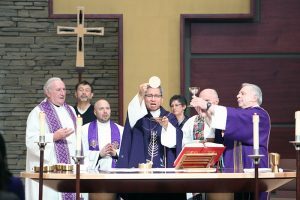 On March 25, 2011, the move from the old church on Bow Trail to its current location in West Springs took place with the transfer of the holy vessels. Two days later, on March 27, the first Mass was celebrated at the new church. First Mass at the new St. Michael’s church building on March 26, 2011. 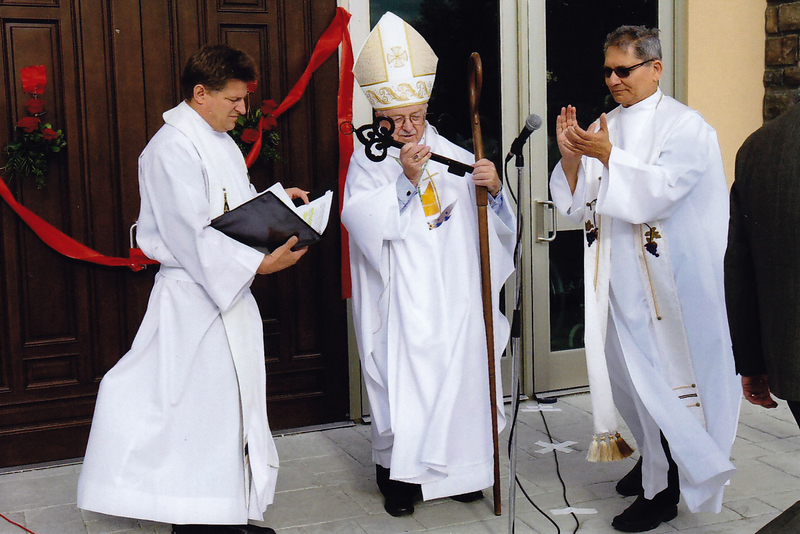 On June 29, 2011, Bishop Frederick Henry officiated the dedication and blessing of the new St. Michael’s church building. New church building consecration Mass with Bishop Henry. June 29, 2011. 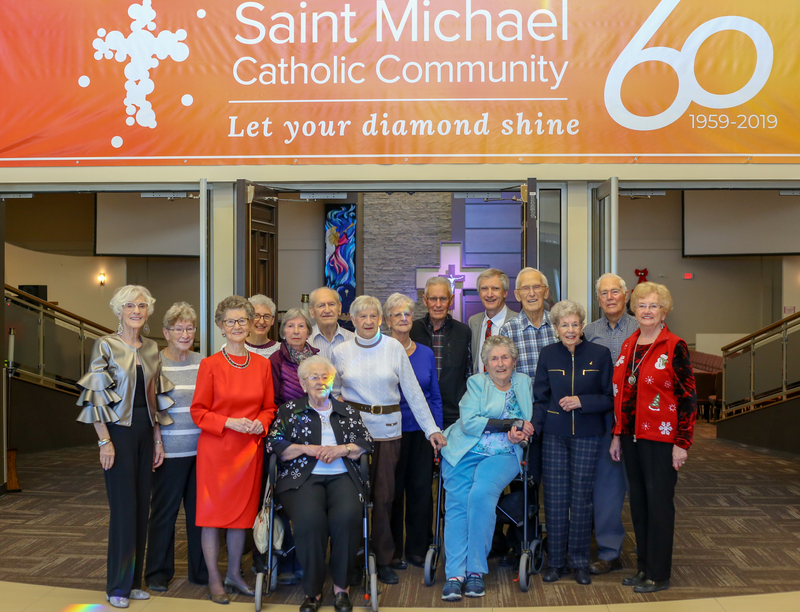 May 3, 2019 marks 60 years since the first Mass as St. Michael’s Parish was celebrated at John Kinahan School. On this day, we will be celebrating with Mass at 7 p.m., followed by a social where some of our parish community’s founding members will be joining. Some of St. Michael’s founding members. Photo taken in 2018.